Acetaldehyde Analysis Cartridge | OndaVia, Inc. 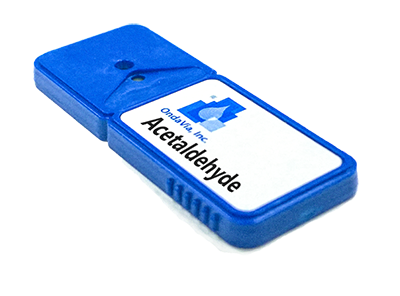 The OndaVia Acetaldehyde Analysis Cartridge is designed to measure acetaldehyde in aqueous solutions. Acetaldehyde (ethanal) is an organic chemical compound with the formula CH3CHO. It is a widely occurring aldehyde, present naturally in coffee, bread, and ripe fruit, and is a contributing factor to hangovers from the oxidation of ethanol by the liver. Acetaldehyde is listed as a Group 1 carcinogen, "one of the most frequently found air toxins with cancer risk greater than one in a million". If lower detection limits are needed, please contact us.